Hello everyone. Stumbled upon the forum while looking for parts, figured I would check it out. I bought my 2018 MT-07 in September 2018 new and just crested 1000 miles on it. I absolutely love this bike and bar none the most fun bike I've ridden. I've done a few things to it (Listed in my profile with pictures) but this summer I'm thinking about giving it a make over. I'm not sure what direction I want to go with it yet but it will come to me eventually. Look forward to talking and sharing ideas with you guys. Welcome to our crazy worldwide family! Keep coming back , this place gets fun in the summers! I dig the matching grips. Welcome! Welcome and congrats! Nudge, nudge! Just a suggestion, if you want your 07 to be different and make people wonder and get them talking go with a super motard style. It's already a naked and wouldn't take much more to get it resembling one real quick. A fender eliminator, high rise bars, shorty levers, etc. and slap a motocross style front fender on it. I've yet to see an 07 done like that. I might do it to mine if I ever get bored with it. 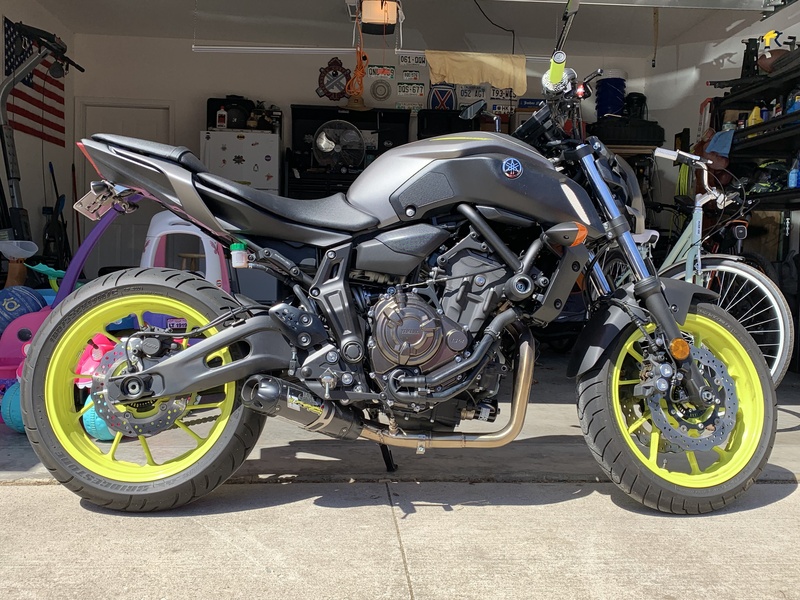 It would be a good excuse to take off whatever else isn't need to save weight and get it leaning more toward a motard style. Being lighter might make it more fun to ride. I think it would be a first on this site.